USES: This medication is used to treat a certain type of nerve disease called amyotrophic lateral sclerosis (ALS, also commonly called Lou Gehrig's disease). Riluzole helps to slow down the worsening of this disease and prolong survival. However, it is not a cure for ALS, and it does not reverse nerve damage or muscle weakness. Riluzole is thought to work by protecting the nerves in the brain and spinal cord from too much of a natural substance called glutamate that may be part of the cause of nerve damage. HOW TO USE: Take this medication by mouth, usually every 12 hours on an empty stomach, at least 1 hour before or 2 hours after a meal or as directed by your doctor. Do not increase your dose or take this medication more often than prescribed. There is no increased benefit with higher doses, but the risk of side effects is greater. Take this medication regularly to get the most benefit from it. To help you remember, take it at the same times each day in the morning and evening. Inform your doctor if your condition worsens. SIDE EFFECTS: Dizziness, lightheadedness, drowsiness, tiredness, nausea, vomiting, diarrhea, loss of appetite, stomach pain, or numbness/tingling around the mouth may occur. If any of these effects persist or worsen, tell your doctor or pharmacist promptly. Remember that your doctor has prescribed this medication because he or she has judged that the benefit to you is greater than the risk of side effects. Many people using this medication do not have serious side effects. Tell your doctor immediately if any of these rare but very serious side effects occur: signs of infection (e.g., fever, chills, cough, persistent sore throat). Seek immediate medical attention if any of these rare but very serious signs of liver problems occur: yellowing eyes/skin, persistent nausea/vomiting, severe stomach/abdominal pain, dark urine. A very serious allergic reaction to this drug is rare. However, seek immediate medical attention if you notice any symptoms of a serious allergic reaction, including: rash, itching/swelling (especially of the face/tongue/throat), severe dizziness, trouble breathing. This is not a complete list of possible side effects. If you notice other effects not listed above, contact your doctor or pharmacist. In the US - Call your doctor for medical advice about side effects. You may report side effects to FDA at 1-800-FDA-1088. In Canada - Call your doctor for medical advice about side effects. You may report side effects to Health Canada at 1-866-234-2345. 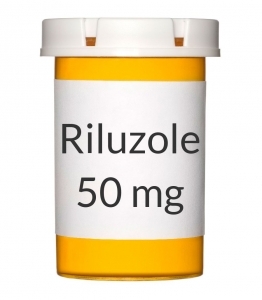 PRECAUTIONS: Before taking riluzole, tell your doctor or pharmacist if you are allergic to it; or if you have any other allergies. This product may contain inactive ingredients, which can cause allergic reactions or other problems. Talk to your pharmacist for more details. Before using this medication, tell your doctor or pharmacist your medical history, especially of: liver disease, kidney disease. This drug may make you dizzy or drowsy. Do not drive, use machinery, or do any activity that requires alertness until you are sure you can perform such activities safely. Limit alcoholic beverages. Smoking may affect the level of this drug in your blood. Tell your doctor if you smoke or use nicotine or if you stop smoking. Kidney and liver function decline as you grow older. This medication is removed by the kidneys and liver. Therefore, the elderly may be more sensitive to the side effects of the drug. During pregnancy, this medication should be used only when clearly needed. Discuss the risks and benefits with your doctor. It is unknown if this drug passes into breast milk. Consult your doctor before breast-feeding. DRUG INTERACTIONS: Your doctor or pharmacist may already be aware of any possible drug interactions and may be monitoring you for them. Do not start, stop, or change the dosage of any medicine before checking with your doctor or pharmacist first. Before using this medication, tell your doctor or pharmacist of all prescription and nonprescription/herbal products you may use, especially of: other drugs that may cause liver problems (e.g., allopurinol, methyldopa, sulfasalazine), drugs affecting liver enzymes that remove riluzole from your body (e.g., amitriptyline, caffeine, omeprazole, rifampin, tacrine, theophylline, quinolone antibiotics such as ciprofloxacin). This document does not contain all possible interactions. Therefore, before using this product, tell your doctor or pharmacist of all the products you use. Keep a list of all your medications with you, and share the list with your doctor and pharmacist. NOTES: Do not share this medication with others. Laboratory and/or medical tests (e.g., liver function tests) should be performed periodically to monitor your progress or check for side effects. Consult your doctor for more details. STORAGE: Store the US product at room temperature between 68-77 degrees F (20-25 degrees C) away from light and moisture. Do not store in the bathroom. . Store the Canadian product at 59-86 degrees F (15-30 degrees C) away from light and moisture. Do not store in the bathroom. . Keep all medicines away from children and pets. Do not flush medications down the toilet or pour them into a drain unless instructed to do so. Properly discard this product when it is expired or no longer needed. Consult your pharmacist or local waste disposal company for more details about how to safely discard your product.